Aaron E. Batt, TSA Federal Security Director for Indiana, presenting the Indiana Challenge Coint to Gurinder Singh Khalsa at the Indianapolis International Airport on January 28, 2019. TSA official thanks members of the community for their gesture. On a cold Monday, it was a delight to see Transportation Security Officers at the Indianapolis International Airport enjoy a nice Indian lunch, along with pizza, gulab jamun and gajar ka halwa. 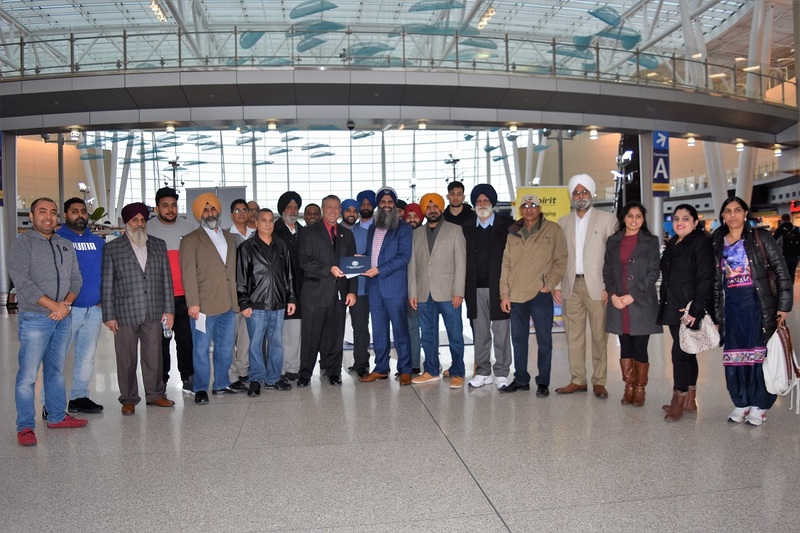 In a heart-warming gesture, the Sikh community of Fishers, Indiana, served hot food for Transportation Security Administration (TSA) workers, who were affected by the federal government shutdown, at the Indianapolis airport on Monday, January 28. Members of the community also donated $6,000 worth of grocery and gift cards. SikhPAC chairman and activist Gurinder Singh Khalsa told the American Bazaar that, even though the shutdown was temporarily lifted on January 25, the gesture was important to get the workers back on their feet and recognize their service. TSA workers were among the worst affected by the longest ever shutdown in the US history.